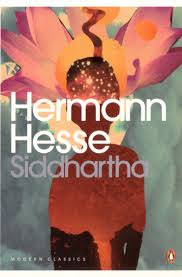 is an excellent book by Herman Hesse. As usual I'm going to quote from a few pages. He learned more from the river than Vasudeva could teach him. He learned from it continually. Above all, he learned from it how to listen, to listen with a still heart, with a waiting, open soul, without passion, without desire, without judgement, without opinions. It also happened that curious people came along, who had been told that two wise men, magicians or holy men lived at the ferry. The curious ones asked many questions but they received no replies, and they found neither magicians nor wise men. They only found two friendly old men, who appeared to be mute, rather odd and stupid. And the curious ones laughed and said how foolish and credible people were to spread such wild rumours. Is it not perhaps a mistake on your part not to be strict with him, not to punish him? Do you not chain him with your love? Do you not shame him daily with your goodness and patience and make it still more difficult for him? Within Siddhartha there slowly grew and ripened the knowledge of what wisdom really was and the goal of his long seeking. It was nothing but a preparation of the soul, a secret art of thinking, feeling and breathing thoughts of unity at every moment of life. From that hour Siddhartha ceased to fight against his destiny. There shone in his face the serenity of knowledge, of one who is no longer confronted with conflict of desires, who has found salvation, who is in harmony with the streams of events, with the stream of life, full of sympathy and compassion, surrendering himself to the stream, belonging to the unity of all things. In every truth the opposite is equally true. For example, a truth can only be expressed and enveloped in words if it is one-sided. Everything that is thought and expressed in words is one-sided, only half the truth; it lacks totality, completeness, unity. The sinner is not on the way to a Buddha-like state; he is not evolving, although our thinking cannot conceive things otherwise. No, the potential Buddha already exists in the sinner; his future is already there. The potential Buddha must be recognized in him, in you, in everybody. The world, Govinda, is not imperfect or slowly evolving along a path to perfection. No, it is perfect at every moment; every sin already carries grace within it, all small children are potential old men, all sucklings have death within them, all dying people - eternal life. In order to learn to love the world, and no longer compare it with some kind of desired imaginary world, some imaginary vision of perfection, but to leave it as it is, to love it and be glad to belong to it. It may be a thought, but I confess, my friend, that I do not differentiate very much between thoughts and words. Quite frankly, I do no attach great importance to thoughts either. I attach more importance to things. I think it is only important to love the world, not to despise it, not for us to hate others, but to be able to regard the world and ourselves and all beings with love, admiration and respect. The thing to me is of greater importance than the words; his deeds and life and more important to me than his opinions. Not in speech or thought do I regard him as a great man, but in his deeds and life. Uncontrollable tears trickled down his old face. He was overwhelmed by a feeling of great love, of the most humble veneration.